Delivering a promise of college access to their students and having high expectations led four schools authorized by LA Unified — two of them independent charter schools with more than 90 percent of their students Latino and low-income — to be selected as 2017 National Blue Ribbon Schools. The distinction, announced Thursday by the U.S Department of Education, recognizes schools with exemplary academic success or significant progress in closing the achievement gap for low-income and minority students. “The biggest reward is knowing that students in this community have a Blue Ribbon school down the street and have access to an excellent education,” said Hadley Huberman, co-leader of KIPP Comienza Community Prep, one of the Blue Ribbon winners. 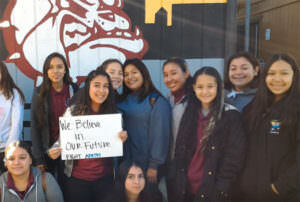 This is the third consecutive year that KIPP LA has had a winner. KIPP Raíces Academy won in 2015 and KIPP LA Prep in 2016. • Alliance Dr. Olga Mohan High School in South LA. Located on the campus of Los Angeles Harbor College, Harbor Teacher Prep offers a dual-enrollment program that allows its 450-student high school students , 55 percent Latinos and almost 70 percent low income, to concurrently earn a high school diploma and community college degree. Vintage STEM Elementary serves a student population where 60 percent are Latinos and the same percentage are economically disadvantaged. 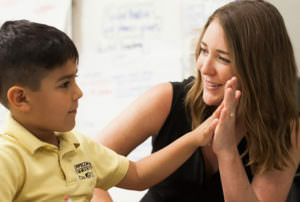 “I could not be more pleased by the work being done by their teachers and administrators, and the impact they are having on the lives of their hard-working students. HTPA is achieving everything I could have hoped for when I worked to ensure the founding of this school,” said board member Richard Vladovic, who represents the Wilmington area. In its statement, the district also recognized the honors to the two independent charters authorized by LA Unified. “Since the first day that our students walk into kindergarten, we make a promise to them that they will receive an excellent education. We start talking about college on day one,” said Huberman, whose school serves 98 percent latino students, with 90 percent qualifying for free or reduced price lunch. The school serves 826 students in kindergarten through sixth grades. Last year, the school added fifth grade and will expand through eighth grade. “Recognitions like these are not only because of the academic results. We focus on values and character and teach the whole child. As a result, our students are the most happy and joyful kids. They run into school every morning excited to be there, and committed to working hard,” Huberman said. Alliance Dr. Olga Mohan High School is the second Blue Ribbon school for charter network Alliance College-Ready Public Schools. Alliance Gertz-Ressler High School won in 2011. “I couldn’t be prouder of the 450 scholars who attend Mohan — this award is an incredible recognition of the hard work these young men and women put in each and every day,” said Mohan Principal Loreen Riley in a statement. Mohan was one of the two high schools in Los Angeles receiving the recognition. Its students are 99 percent Latino and 95 percent low-income. Last year’s graduation rate was 99 percent, with 87 percent accepted to four-year colleges and universities, according to Alliance. “When I got to Mohan, I knew I was going to go to college. My counselors made sure I knew it. My teachers made sure I knew it. Like all Alliance schools, Mohan has a mentality and culture of asking ‘where’ you are going to college, not ‘if’ you are going to college,” Andrew Castillo, a Mohan alumni and sophomore at Brown University, said in the statement. In total, California had 25 schools recognized as National Blue Ribbon Schools for 2017, among the 342 schools selected nationwide. The complete list of schools and their profiles can be found here.